Prleška tünka was “manufactured” by farmers in the countryside due to the fact that meat, acquired from pigs, had to be conserved in a way. Since every house had several pigs, the time of pig slaughter was always in the winter. Climate conditions did not permit for the meat to be stored for longer periods of time during warmer months. A characteristic of pig slaughter was also, that they used all the parts of the pig. This caused the evolution of the so called traditional products and dishes, such as tlačenka, sour soup, baked blood, stuffed stomach, dry sausages, dried hams and also tünka. 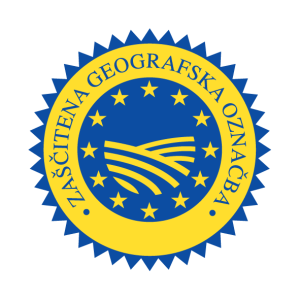 Geographically protected product mark, which can be found on products of certified manufacturers. For the meat to remain useful for a longer time or, that it could be stored for the entire year in a time before refrigerators and freezers, the meat was thermally processed and sunk – “tünkali” – into minced lard. This was then stored in wooden dishes, that are up to today locally known as “tünka”. In this way, the meat would remain useful for a longer time, regardless of not having the technology to store meat products. The result of this traditionally rational process is also a culinary specialty, whose taste makes it unique and therefore interesting. Due to the connection of meat and minced lard, within which the meat matures, a specific flavour evolves, giving this product its culinary value. Prleška tünka is produced in this way until this very day, both in households for their own use, as well as under the conditions of market oriented industrial manufacture.